The 3rd DCFTA Central Advisory Council, Tbilisi. 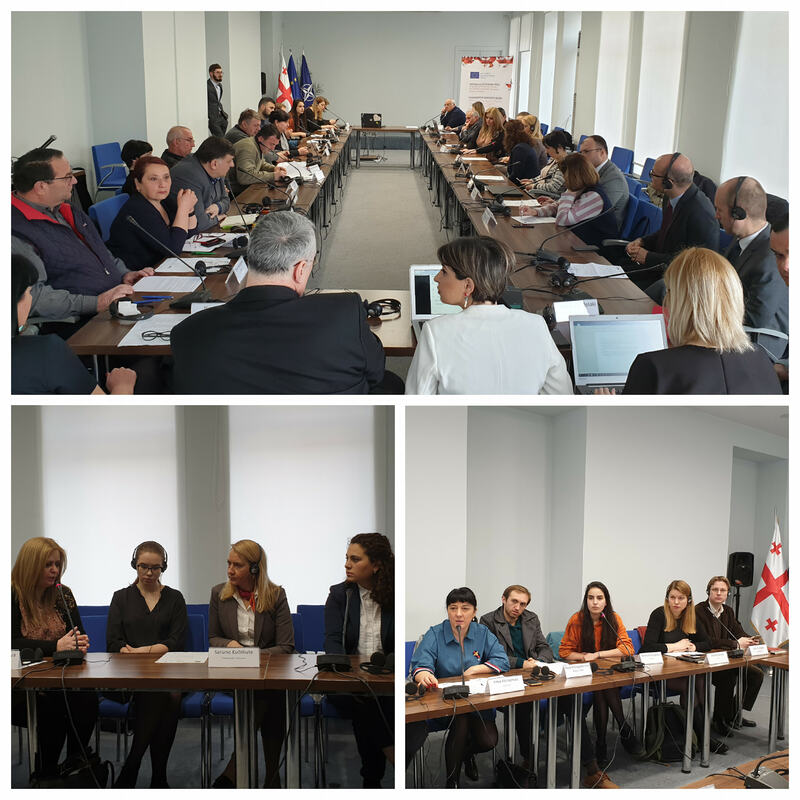 On March 7, the third meeting of the DCFTA advisory council took place in Tbilisi. The participants of the meeting were the CSOs from different regions, representatives of EU delegation, the Ministry of Environmental Protection, Ministry of Education and Sustainable Development and Agriculture and the Ministry of Economy and Sustainable Development. The meeting was organized under the framework of the project 'Georgia on European Way: Creation of Effective Model for DCFTA and SME Strategy Implementation'. This meeting gave the business operators and the regional civil society organizations an opportunity to provide cross-sectoral recommendations before the state representatives and donor and discuss the problems together. The first specific discussion topic was vocational education which was raised by one of the representatives of the regional CSOs who drew the attention of the audience on the existing educational gaps and lack of educational funds in Kvemo Kartli. The representative of the Ministry of Education mentioned that one of the main priorities of the ministry is to develop professional education in Marneuli. Simultaneously, she clarified that ministry actively cooperates with the private business operators and tries to find a solution together with them in order to retrain the locals and involve private providers in these processes. The recommendations regarding the regional consultancy centers were proposed by the CSO representatives from Imereti and Kakheti regions. Everybody agreed that establishing the consultancy centers was quite a good idea, but he simultaneously mentioned that in some cases, they are not flexible and helpful. They suggested supporting consultancy services, which will be established on the basis of the private sector. “Maybe the outsourcing is not profitable in some high mountainous regions, but in general it will be more effective if the private sector representatives are also involved”- said one of the sub-grantees. Generally, there was a consensus between the attendees regarding the matter of creation of the private consultancy services in the regions. In response to the recommendations and complaints of the regional CSOs representative of the Ministry of Environmental Protection and Agriculture of Georgia said that “All people employed in the consultancy services are qualified and they have adequate knowledge”. It was interesting for the audience to hear that there is no being created the non-governmental nonprofit legal entity which will function as the consulting service centers, so they will not depend on the state funds. The next discussion topic was about information dissemination. One of the sub-grantees proposed the idea to create internet TV at first and after its development start running the pilot TV program on TV2 under the umbrella of the First Channel (Georgian Public Broadcaster). The guest from the Ministry of Environmental Protection and Agriculture promised to raise the question at the ministry regarding the TV broadcaster about agriculture and test how profitable will it be. The fourth discussion topic had been proposed by one of the SME representatives who emphasized on the fact that the quality of the plant protection means are not in compliance with the official standards. The attendees also complained that nobody controls what the local sell. Moreover, the attendees stressed on the need for doing the land analysis and they proposed to partly subsidies this process. In response to this, the representative of the Ministry of Agriculture said that there exists such program “Seed Your Future” under the framework of which it is possible to conduct the land analysis. The second ministry representative stressed that there already exists the monitoring mechanism, which results are statistically recorded and there is a clear sign of improvement in terms of the quality of the plant protection means. He mentioned that this process goes slowly and they physically do not have so many veterinarians. The final topic of discussion was the insurance system. Both CSOs and SMEs attending the meeting supported the idea to develop the insurance services in cooperation with the private sector. In response to which recommendations, the representative of the Ministry of Agriculture explained that the state initiated this, but it is about the private insurance and not the Public-Private partnership model. He hereby mentioned that if the business is not profitable, then there is no point in providing insurance at all and directly said the such kind of business is not worth to run because the dependence of insurance is not the solution. As a positive example, he mentioned that the state financed the insurance of berry plants with 100% because it is very profitable especially in the Western part of Georgia. Finally, the representatives of the EU delegation, implementing partners and the state representatives made the concluding remarks and all three sides expressed their readiness for the future cooperation in terms of solving the existing problems collectively in a working group formats.